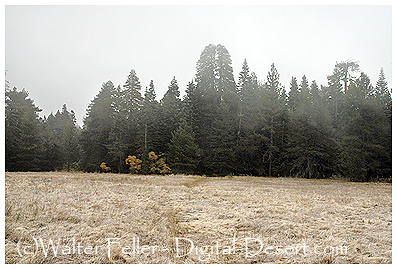 Lodgepole Pines are common in the Sierras where it is colder, but rare in Southern California. 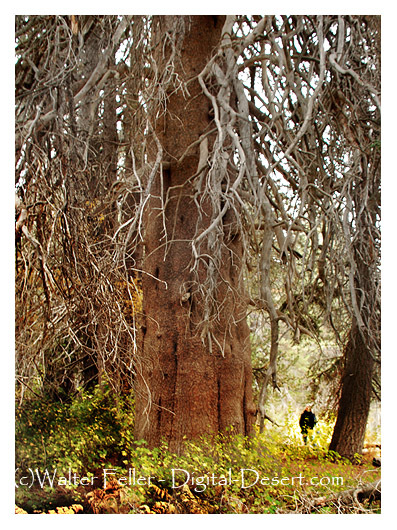 Lodgepole pines seldom grow taller than 70 feet and in Southern California they usually grow above 8,000 feet. An exception to these rules occurs high on the mountaintop about 3 miles south of Big Bear Lake near Bluff Lake. Bluff Lake is a shallow lake owned by the Wildlands Conservancy reserve that is surrounded by lush forest and green meadows. Here at an elevation of 7500 feet, grow the largest Lodgepole pines in the world. This small pocket of Lodgepole Pines is thought to be a remant from a time when the climate was colder. The world "Champion" (discovered in 1963) is a magnificent, double-topped tree that towers above the surrounding forest reaching a height of roughly 110 feet. It's age is estimated to be older than 450 years, which means that it germinated about 1560. The Champion Lodgepole Pine Trail is an easy one-mile round trip hike located on the south side of Big Bear Lake. The trail features a wet meadow and mature conifers including the largest recorded lodgepole pine (Pinus contorta) in California! The self-guided trail has 14 numbered posts that correspond to an interpretive guide which is available at the trailhead. The guide highlights the unique diversity and natural history of the area. For those looking for a longer hike with additional wildflower viewing opportunities, the Siberia Creek Trail junction is near the Champion tree: watch for the sign. Viewing Information: The hike begins by crossing over a small wooden footbridge where a year-round stream parallels the trail. Spring wildflowers include kelloggia (Kelloggia galioides), columbine (Aquilegia formosa),andAmerican speedwell (Veronica americana). Large boulders, old growth white fir and Jeffery pine punctuate the views along the trail and provide ideal habitat for San Bernardino beardtongue (Penstemon caesius), great red paintbrush (Castilleja miniata ssp. miniata), white catchfly (Silene verecunda),and woolly sunflower (Eriophyllum lanatum var. obovatum). The surrounding meadow is especially beautiful in the spring and presents a diverse assortment of native flora throughout the growing season including western mountain aster (Symphyotrichum spathulatum var. spathulatum), corn lilies (Veratrum californicum), Parish’s yampah (Perideridia parishii), ranger’s buttons (Sphenosciadium capitellatum), and bracken fern (Pteridium aquilinum). As with any sensitive area, please stay on the trail and respect the nearby private property. Safety First: The road is not plowed in the winter and can retain moisture late into the spring, be sure to check the road conditions before you travel. The summer months are usually hot, it is important to bring plenty of water and wear sunscreen. Summer thunderstorms are common at higher elevations so be prepared for changing weather conditions. A high clearance vehicle is recommended. Directions: From State Highway 18, turn south on either Tulip Lane or Mill Creek Road (they intersect), watch for Forest Service road 2N10 and follow for 4.5 miles. Turn right on 2N11 and continue for 1 mile to the trail. Trail guides are available at the trailhead or the Big Bear Discovery Center.